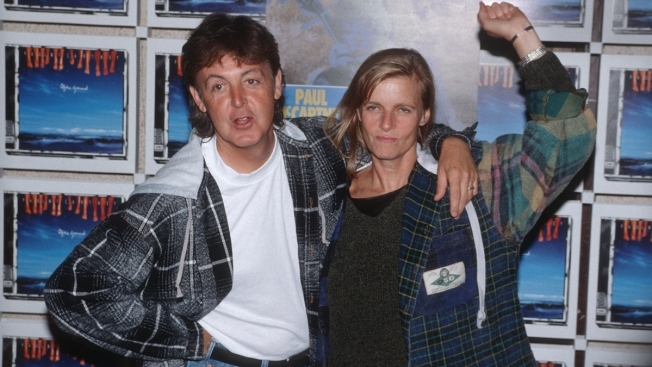 Paul McCartney and Linda McCartney pose at a photo call at the Olympic Stadium on Sept. 3, 1993 in Berlin, Germany. The Victoria & Albert Museum in London, said May 3, 2018, that Paul McCartney has donated 63 photographs taken by his late wife Linda to the museum's new photography centre. The Victoria & Albert Museum says Paul McCartney has donated 63 photographs taken by his late wife Linda to the museum's new photography center. The collection includes Linda McCartney's portraits of The Beatles, The Rolling Stones and Jimi Hendrix as a well as images from nature and photos of her family. The V&A's senior curator of photographs, Martin Barnes, said Thursday that Linda McCartney was "interested in unguarded moments and intimate moments, unstaged moments," whether taking pictures of her family or of celebrities. The photos will go on display at the V&A's national photography center, which opens Oct. 12.